There are three snacks that I distinctively remember from my childhood that my sister would feed me. The first was a spoonful of peanut butter, which was just that. I remember licking it off the spoon like ice cream. The second was a bit more substantial and complicated: a slice of bread topped with an American cheese single and spread with leftover spaghetti sauce, then sprinkled generously with garlic powder and baked in the toaster oven. Classy, I know. We called it Crazy Bread. And then there was Jilly Jam. Toast + butter + jam. 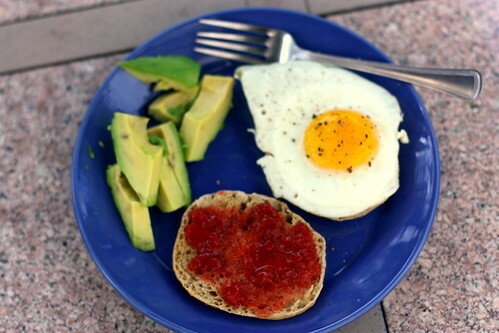 Not only did I have Jilly Jam for breakfast, but it also became an afternoon snack, or right-before-bed snack, or just-because snack. I still get cravings for it. Just a few months back, all I wanted to eat after dinner was toast and jam, toast and jam. The cravings usually end abruptly, and don't return for another few months, or even years. But when Jenny made homemade jam a couple of weeks ago, the Jilly Jam returned in full force. 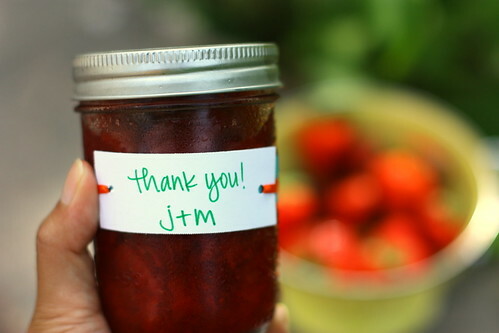 Jenny made this strawberry lemon jam herself, and filled cute little jars tied with ribbon and labeled J+M, for Jacqui and Murdo. We passed them out as party favors at my wedding shower, because Jenny is crafty and creative like that, and I'm just grateful for that. 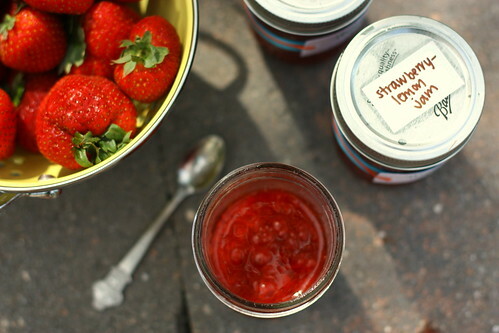 The jam has a refreshing lemony tang to it, with chunks of strawberry that spread smoothly over toast. Fruit on bread. Who thinks of this stuff? Geniuses, that's who. I wish I could tell you more about the jam, like how easy it is to make, except that I didn't make it. I just ate it, so all I can tell you is that it tastes good. But just look at that recipe. All you need are strawberries, sugar, lemons, and jars. Jenny found that a bunch of recipes called for pectin to help the jam keep longer, but she wasn't too into the hard-to-pronounce ingredients and chemistry behind pectin, so she went without. The jam only lasts for two weeks in the fridge, but when you're on a Jilly Jam kick, that's really not a big issue. 1. Clean, hull, and slice berries. Put a small plate in the freezer. 2. 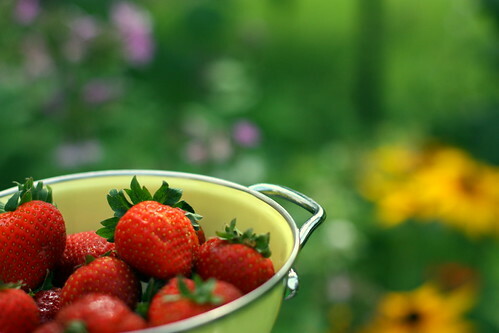 Place berries in a dutch oven. Toss with lemon juice, zest, and sugar. 3. Heat over medium heat until mixture boils and becomes frothy. Lower heat to medium low and let simmer for 30 minutes. Continue to simmer until a small amount of liquid gels when spooned onto the chilled plate. 4. Remove from heat. Let cool in pot for 5 minutes, then pour in a rectangular baking pan to cool. When at room temperature, ladle into jars. Yields 7 jars. Refrigerate up to 2 weeks. I think when I meet your sister Jenny someday, I am going to want to give her a big hug. I like the way she cooks/bakes, and this jam looks fantastic! What a lovely and thoughtful favor! I just received the gift of some homemade strawberry jam at work and nothing is more thoughtful than something homemade with love. shanna - i really think you two would get along! 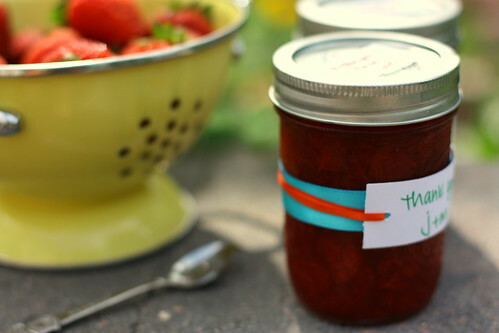 nicole - there is something just so cozy and comforting about homemade jam! 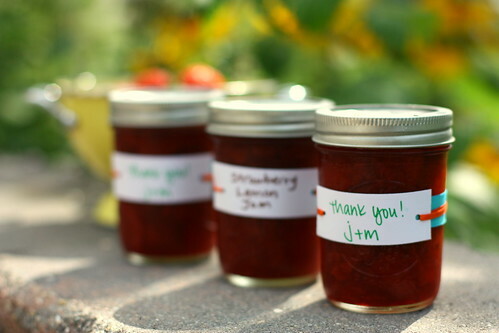 Love making my own jam...it's so easy and is really so much better than store-bought! I make small batches so I don't worry about having to keep them for long :) I think homemade jam is an awesome wedding shower favor! A birthday and a cake.